Most closed tibial fractures can be treated nonoperatively with good results, but infection risk and fracture stability must be considered. Littenberg et al reviewed 2372 case reports of closed tibial fractures and compared clinical outcomes of cast treatment, open reduction and internal fixation (ORIF), and intramedullary rod therapy. They showed cast treatment to be associated with fewer superficial infections than ORIF was; however, ORIF demonstrated a higher union rate at 20 weeks. In some instances, the fracture cannot be treated properly with nonoperative methods. Operative fixation is required when fractures are unstable. Instability is defined as greater than 1.5 cm of shortening, more than 5° of varus or valgus angulation, 10° of anterior or posterior angulation, and/or less than 50% translation while the leg is in a cast. Factors that contribute to instability are the degree of comminution, the presence of ipsilateral fibular fractures, and the location of the fracture along the tibia. The original presenting radiograph is useful because it is often the case with cast or brace treatment that the original amount of shortening is what the fracture ultimately heals with; therefore, shortening greater than 1 cm is a relative indication for operative stabilization. Patients with Gustilo type II and III open fractures should always be taken to the operating room for irrigation, debridement, and possible surgical fixation (eg, intramedullary nailing, external fixation, plating). Situations in which an open fracture should not be corrected on an emergency basis are rare. In some cases, however, especially in the setting of polytrauma, definitive fracture treatment may be delayed. If surgery must be delayed, leg appearance and compartmental pressure must be monitored carefully. Several contraindications for surgical treatment of tibial shaft fractures are recognized. All patients require a thorough preoperative evaluation and must be cleared for general anesthesia before any operation, including treatment of tibial shaft fractures. 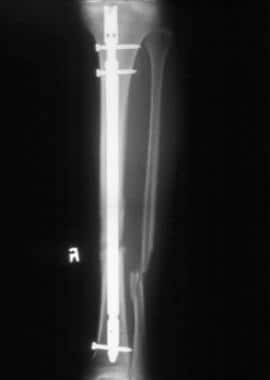 In cases of acute trauma, patients should be stabilized by the trauma team before fixation of a tibial shaft fracture. Incision and drainage of infected fracture sites are often indicated; however, hardware should never be placed into an infected wound. In cases where infected hardware is removed, treat the infection with intravenous antibiotics and replace the hardware in a second surgical procedure after the infection has been treated thoroughly. Closed fractures with minimal displacement or stable reduction may be treated nonoperatively with a long leg cast, but cast application should be delayed for 3-5 days to allow early swelling to diminish. The cast should extend from the midthigh to the metatarsal heads, with the ankle at 90° of flexion and the knee extended. The cast increases tibial stability and can decrease pain and swelling. Early ambulation with weight-bearing as tolerated should be encouraged. Tibial shaft fractures treated with casting must be monitored closely with frequent radiographs to ensure that the fracture has maintained adequate alignment. Adequate callus formation generally takes 6-8 weeks before cast therapy can be discontinued. Three years after describing the patellar tendon–bearing cast, Sarmiento proposed another treatment, the functional brace. This device has replaced the long leg cast in many circumstances because it can be put on within 2-4 weeks of injury. It allows more movement of the knee and ankle while still protecting the tibial fracture. Movement of the knee and ankle may decrease the stiffness that patients encounter after the fracture is healed. However, the long leg cast is still used for the first few weeks until the fracture begins to stabilize. Although no definitive nonoperative treatment has been determined for tibial fractures, many authors have noted increased nonunion and healing time with casts and braces as compared with surgical fixation. [19, 20, 21] Therefore, casts and braces have limited use, especially with displaced fractures. The ideal candidate for nonoperative treatment is a young patient with a nondisplaced fracture. Operative fixation is required when fractures are unstable. Surgical options include plating, external fixation, intramedullary nailing, and, in some cases, amputation. If a tibial shaft fracture is associated with a break in the skin, the wound should be treated as an open fracture (see the image below). The important factors for successful treatment of contaminated open tibial fractures include radical debridement of necrotic tissue, pulsed lavage of the area to remove bacteria, and prophylactic intravenous antibiotics. Open fractures are surgical emergencies. Most patients should be scheduled for debridement and irrigation within 6 hours of the injury (see Indications, above). For antibiotics, frequently an aminoglycoside combined with a cephalosporin is adequate. For low-grade open fractures, antibiotics such as first-generation cephalosporins are used. For higher-grade injuries in which dirty wounds and infection are more likely, penicillin and aminoglycosides are appropriate. Repeat debridements (every 24 hours, as needed) often are used in injuries with extensive soft-tissue injury, in severely contaminated wounds, or in wounds with vascular compromise in which additional necrotic tissue may present itself. Soft tissue usually is covered (using sterile technique) within 1 week of injury. A splint should be used for stabilization. The splint usually remains intact until the patient is prepared in the operating room. Plating is a viable surgical option for tibial shaft fractures and was once the treatment of choice. The procedure involves using a large surgical incision, reducing the fracture, placing a metal plate over the fracture, and fixing the plate onto the bone with multiple screws. Because of the extensive soft-tissue manipulation required, plating can be difficult for the surgeon and damaging to the local vascular supply. In fact, some authors believe that it is not indicated for open fractures, because of an infection rate as high as 44%. Intramedullary nailing and external fixation have replaced fracture plating because they entail decreased technical difficulty, infection rates, and damage to local soft tissues. One study designed a two-stage protocol for tibial segmental fractures and assessed the outcome of this treatment. After anatomic reduction followed by soft-tissue reconstruction, a low-profile locking plate was temporarily applied as an external fixator. In the second stage, internal fixation with a locking plate was applied by using a percutaneous plate osteosynthesis technique. After a median follow-up of 32 months, the authors noted that all fractures achieved union; median time for the proximal fracture union was 23 weeks and 27 weeks for the distal fracture union. These results suggest that this two-stage procedure achieves excellent knee and ankle joint motion and good functional outcomes. 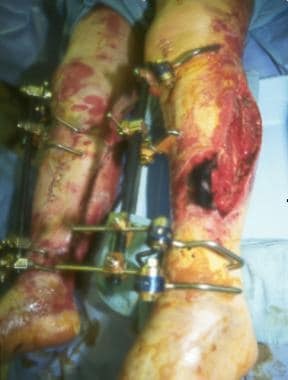 External fixation (see the image below), in which multiple pins are attached to the external rods to maintain length and alignment, is a widely used and very successful method of treating some types of tibial shaft fractures. It is particularly useful for proximal tibial fractures that may be difficult to align properly with intramedullary nailing. Another common indication for external fixation is a severely comminuted fracture pattern that is hard to align for reaming and nailing. External fixation is also useful for tibias in which the intramedullary canal is too narrow to ream. Intramedullary nailing with locking screws (see the image below) has become the treatment of choice for most tibial shaft fractures. [35, 36, 37, 38, 39, 40] The prevalence of nonunion and malunion is greatly decreased in comparison with the other methods of fixation. Patients are also able to return to low-impact activities much sooner than they can with the other treatments. Although intramedullary nailing is generally accepted as the standard of care for treating many types of tibial shaft fractures, specific techniques are not without controversy. The point of contention most frequently involves whether the tibia should be reamed before the intramedullary nail is placed. In a similar study performed on closed fractures, however, reamed tibial fractures had substantially better results than unreamed tibial fractures. A prospective, randomized trial also appears to show a benefit for reamed nailing over unreamed nailing in closed fractures. Regardless of preference for the reamed or unreamed technique, tibial nails remain the treatment of choice for open tibial fractures. The Mangled Extremity Severity Score is a tool that has been developed to help the surgeon decide whether or not amputation is indicated, but it is only part of the equation. Surgical expertise and patient communication are of vital importance when making amputation decisions. After the surgical procedure, the patient should be monitored in the postanesthesia care unit until stable. Depending on the extent of the other injuries, the patient may be transferred to the surgical intensive care unit or to a regular ward bed. Initially, the patient's vital signs should be monitored repeatedly, with careful attention paid to any abnormalities. If a complication occurs, early discovery almost always improves the prognosis. On postoperative day 1, the patient should be examined by the surgical team, and a complete blood count should be obtained. Once the patient has recovered from surgery and is considered safe to leave the hospital, he or she should be discharged home or to a suitable rehabilitation facility. The complication that should concern every physician treating a tibial shaft fracture is compartment syndrome, which occurs when the pressure inside a particular fascial compartment of the leg is elevated to a point where it can cause restriction of blood flow and nerve damage. The usual causes of compartment syndrome include hematoma and soft-tissue swelling. 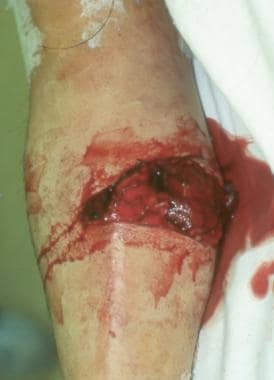 The signs of compartment syndrome traditionally are defined as increased pressure, pulselessness, paresthesia, pain, and pallor to the distal affected extremity (the five Ps); pulselessness and pallor are also associated with vascular injury. The most reliable signs are increasing pain with passive stretching of the muscles within the compartment and hypesthesia. The physician need not observe all of the signs to diagnose compartment syndrome. A high index of suspicion should be maintained for this complication, and aggressive surgical treatment is mandatory. Always remember that decreased pulses may not manifest until late in the process. Many surgeons now advocate the use of pressure monitors to aid in treatment decisions. Compartment pressures higher than 25-30 mm Hg are concerning and indicate the need for a surgical consultation. 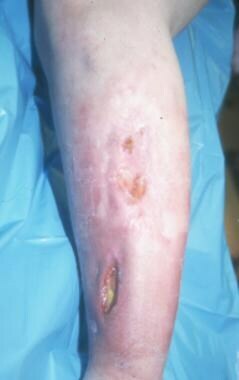 Treatment of compartment syndrome involves fasciotomy. A fasciotomy is performed by making two longitudinal incisions in the affected leg, one laterally and one medially. The lateral incision allows the surgeon to access and decompress the anterior and lateral compartments, while the medial incision offers access to the posterior compartments. During this procedure, all four compartments must be opened to survey damaged vessels and to ensure decompression. Infection is a concern with any surgical procedure, especially with open fractures. The risk of infection also increases when surgical hardware (nails and fixator pins) is placed into the area. (See the image below.) For this reason, irrigation, debridement, and intravenous antibiotics are vitally important. Also, the value of conscientious nurses and house staff cannot be overemphasized for the recognition and treatment of early infection. A common and frustrating complication of tibial fractures is nonunion, defined as a fracture that has been present for 9 months with no visible signs of healing for the past 3 months. Some of the many causes of nonunion include infection, malnutrition, unstable fracture fixation, and incomplete fracture reduction. Treatment of nonunion is guided by the underlying cause. If the wound is infected, irrigation, debridement, and antibiotics are indicated. After the infection is cleared and any malnutrition is treated, a different method of fixation may be used. It should be noted, however, that adding hardware such as intramedullary nails or external fixator pins is almost never indicated in an infected leg. Treatment of all forms of tibial shaft fracture has been fraught with complications. An analysis of prospective, randomized, controlled trials demonstrated that the combined prevalence of nonunion was lowest with operative treatment but the prevalence of infection was greatest with operative treatment. The prevalence of infection with plate fixation was greater than that with intramedullary nailing. To deal with the problem of nonunion, initial external fixation of open tibial shaft fractures has undergone subsequent conversion to intramedullary nailing. Studies have shown poor progression to union with this technique, as well as increased surgical complications. Alternative treatment options should be considered before conversion of external fixation to intramedullary rodding. Depending on the surgeon's preference, the patient usually is seen in a clinic 2-3 days after discharge, and radiographs are taken to view the reduction. If the reduced fracture is still properly positioned, the patient returns on a regular, less frequent basis for radiographic and clinical examination of the leg. Once the patient has healed, braces and external fixators may be removed. Many tibial nails are not removed and may remain in the patient indefinitely.